Bring your full attention to the patient to gain perspective. 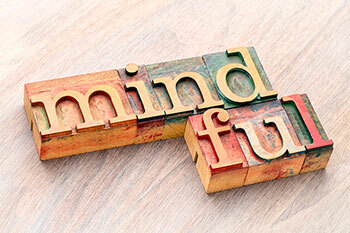 Mindfulness is the psychological process of bringing one’s attention to experiences occurring in the present moment, which can be developed through the practice of meditation and other training. We possess nothing more fully than our own minds and no gift greater than the application of our minds to the observation of the patient—a mindfulness grounded in reality. Pay attention to the environment. The next time you assess a patient, pay close attention to the environment. Listen carefully to what he or she has to say. Be sure to include evidence of fatigue or overstimulation. Look for actual changes, and delay your own judgments. Make the familiar new again. Focus on the person’s medical and nursing diagnoses, and look at them with fresh eyes. Look for at least one new detail (a positive or negative change) about each patient that you didn’t see Are they still valid? Should anything be added? Subtracted? Focus on the patient’s breathing. Let your awareness of everything else fall away and pay attention to how the air passes in and out. Notice the way the person’s abdomen expands and collapses with each breath. Simply become aware of what’s happening around this person, breath by breath. Consciously assess the patient. Take a quiet moment while you’re next to the patient and look at him or her closely. Smell the patient, feel his or her hand. Slowly and deliberately focus on each body system. Notice any changes, as well as your own impulse to leave and perform other functions; listen carefully to any thoughts or emotions the patient expresses. This kind of in-the-moment, noticing mindfulness is like the concept of the impartial spectator first introduced in the 18th century by Adam Smith, who wrote that we all have access to an “impartial and well-informed spectator.” This spectator’s form of attention puts us in the present and gives us a more unbiased perspective. It forces an exquisite awareness of “what is” right now. And it’s Nightingale’s special gift to the profession: Sensitive attunement and awareness of what is happening to and within the patient to help you respond mindfully instead of reflexively. Nightingale F. Notes on Nursing: What It Is and What It Is Not. Los Angeles: Enhanced Media Publishing; 2017 [originally published in 1882]. Kelly J. Editorial: What has Florence Nightingale ever done for clinical nurses? J Clin Nurs.2012;21(17-18):2397-8.